You’ve heard about multi-mile obstacle course challenges like Tough Mudder, Spartan Race, and Warrior Dash. You know they take a crazy amount of training and mental toughness. 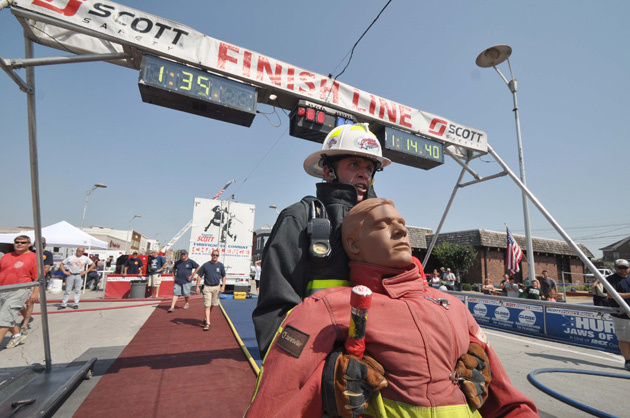 But these races are nothing compared to the insane, muscle-demanding, explosive cardio threshold it takes to finish the Scott Safety Firefighter Combat Challenge—five obstacles crushed into a course that takes only about 120 seconds. It’s billed as the toughest two minutes in sports. Why? Because this isn’t an obstacle course just anybody can do. These guys aren’t just athletes. And staying fit is much more than just a job. For them, the difference between good fitness and great fitness can mean the difference between life and death. Founded in 1991 by Paul Davis, Ph. D., an exercise physiologist and former firefighter himself, the Combat Challenge is an obstacle course where U.S. and Canadian firefighters race through 5 stages wearing nearly 50 pounds of gear. They blow anywhere from 100-250 calories per course run, depending on their size and speed. (FYI: When they’re fighting actual fires, they burn anywhere from 540 to 800 calories an hour.) 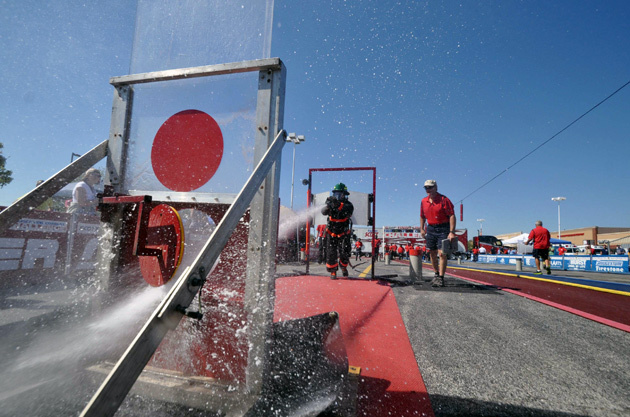 The challenge promotes firefighter fitness and shows just how rigorous the profession is. In 2013, the challenge will institute a civilian competition category so anyone can try to beat it. To get a taste, watch top firefighters go head to head in the World Cup championships held in Myrtle Beach, South Carolina from November 12-17. We checked in with nationally certified fitness trainer and competing firefighter Michael Medeiros to get a handle on just how tough the Combat Challenge is—and the badass level of fitness it takes to compete. MF: What really makes this challenge so difficult? Michael Medeiros: It’s called the toughest two minutes in sports because of the amount of work the body does in such a short time. You go through so many physiological changes and mental stress breakdown. Plus, you combat the resistance of every task loaded with heavy gear. NFL football players tried it many years ago against firefighters, and they had a super rough time with it—mostly when they tried to go at full speed. Most people and firefighters who attempt this challenge at a moderate speed can finish, but the same folks who try it at top speed—even your elite fitness athletes—fail half way through. MF: What are the Combat stages? MM: You start running up the 5-story tower, which puts a strain on the legs and jacks your heart rate way up. Then you switch to intense upper body by hoisting 42 pounds of hose and 7 pounds of rope. Most of your oxygenated blood is still pooled in your lower body, so you have to power through and continue to breathe as normally as possible. Then, you quickly descend the tower, engaging the lower body to keep from falling and locking out your knees. When you hit the ground, you must jump onto a force sled that you strike with a 9-lb. mallet, utilizing that upper body again while bent over and putting a strain on your legs. (You’re also pushing your tired, heavy diaphragm up into your chest while trying to get full breaths.) Then you dodge around markers staggered every 150 feet until you pick up the 240-lb., 100-foot hose line, which is charged with water pressure. You drag it 75 feet, and if you fail to pick up speed, that causes more friction on the ground and gives you even more resistance than the weight itself. And to finish, you rescue a mannequin-victim weighing 175 lbs. You pick it up and run backwards 100 feet to the finish without falling. MM: These tasks are set up to drain the body of energy and mimic the effects of a structure fire. The body switches to glycolytic metabolism (anaerobic state) as you come off the tower, and your legs are taxed to the max. You tend to feel like they’ going to break down since they are filled with lactic acid! Your mind then tries to compensate and slow you down, so that is when you have to muster through and utilize the anaerobic conditioning that you have to finish strong and keep the same speed. MF: What’s the current Challenge record? MM: The World record run for the male division is 1:19 minutes. Most of the fastest males today run the challenge in 1:39. MF: What does a typical firefighter training plan look like? MM: Most competitors have a fitness program that ranges from high intensity interval circuit training to running courses similar to the challenge to build a strong aerobic foundation. A lot of departments require their firefighters to work out one hour per shift. Competitors can log as many as 10 hours per week in the gym doing high intensity training, like Olympic lifts, as well as 8-12 hours a week on a simulated course. MF: What do they have to eat to keep up with the calories they’re burning? MM: A lot of competitors like us choose a high-protein diet. We try to keep our fat, sugar and sodium intakes low due to the fact that we supplement our workouts and challenges with pre-workout drinks, like 5-Hour Energy or Gatorade. As for post-workout, most will intake a 50/50 mix of protein (think meat or nuts) or quick-burning carb (think pasta or bread).